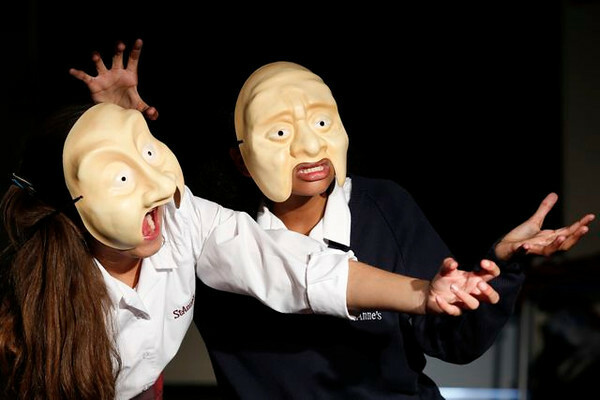 Drama at St Anne’s is unique within the curriculum, not only because it teaches pupils about cultures and histories, but because it can also play an integral role in personal and social education. We aim to develop creative expression and communication whilst engendering a sense of independence and confidence, promoting curiosity and engagement in both the theoretical and performance elements of Drama. Pupils are encouraged to use their initiative and embrace challenges by persevering and finding creative solutions – learning self-awareness and group sensitivity. Pupils will be introduced to various elements of drama and performance. These include improvisation, characterisation, vocalisation, movement and script work. These elements are taught through a variety of themes, subjects and styles such as Shakespeare, Commedia Dell’arte and mime. Pupils are assessed every half term to consolidate learning and monitor progress. Component 2: Comprises of students learning 2 extracts from a play (chosen by the centre). They will perform 2 of the following; monologue, duologue or in small groups from the chosen play. These performances will be to an external examiner. No written work is required for this component. Component 3: Comprises of learning about and understanding a set text prescribed by the exam board. They must be aware of how this text is conveyed on the stage from an actors, directors and designers point of view. There will be questions in the written exam based on an extract from this set text. In addition students will experience live performances and be expected to answer questions in the exam about an aspect of that performance. The written exam is 1 ½ hours long. Pupils have the opportunity to perform in extra-curricular activities such as Drama club, school productions, assemblies and talent evenings. There are opportunities to attend trips to watch live Theatre at KS3 and KS4, which in turn equips pupils with the necessary tools to respond to the requirements of the ‘Live Theatre’ element of the written exam at GCSE.